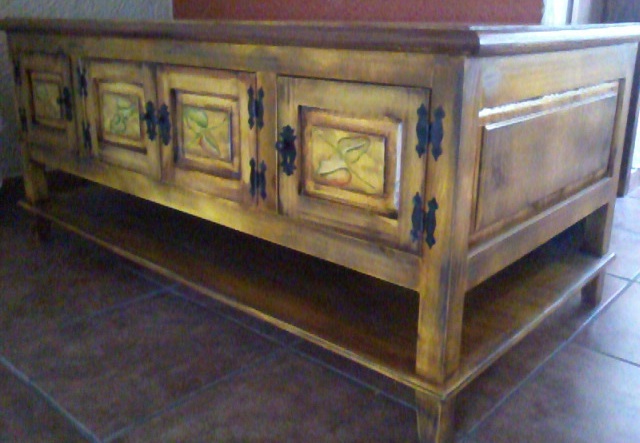 Our Antiqued hand painted buffet features many lovely details. It exudes beautiful cottage and/or hacienda style charm. The piece is crafted from kiln-dried solid pine. The artist applies paint in layers, weathering, sanding and sponging. Finally, a protective coat is applied and the wrought iron hinges and last touches are incorporated. The effect is that of a well-traveled, well loved piece of furniture that has been in your family for many years ... and will be with you many years more. Beautiful design and attention to detail. Please be aware that every piece is unique and different and that ornamental details may vary.